Customer satisfaction is our top priority. We make and sell all kinds of signs from vehicle to storefront. 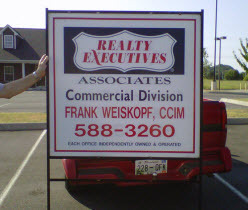 We sell real estate signs and other yard signs for service professionals. We also sell sign holders and a variety of banner stands.